Anyone else try the new latest and greatest from the pit yet ? I know your probably busy with the beta version of PCmatic, but even an auto response to the beta test e-mail addy would be cool. I got your mail! We just got a lot of responses. I plan to respond to every body and I really appreciate the testing. The response has been fantastic and I sincerely appreciate it. Yes, I'm currently using this product. Right now, I've got to reinstall it in order to use the schedule and I've accidently deleted the email with the link in it two weeks ago . 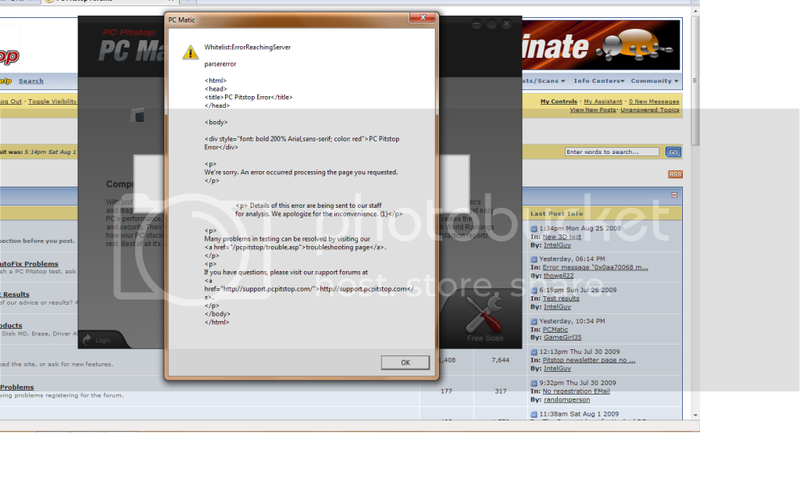 Error w/ PC Matic and Win 7. Try again. I think this problem is fixed. Is there a link to this product? I can't find it. It is not for sale yet. This is a really slick program. If I may ask, what's it gonna go for? If you can't say on the open forum, would you PM me? I'd be interested in purchasing it. I just bought PC Matic and have installed it on my Notebook and my powerhorse NZXT. I have a small problem though, well ok not soo small. On my NXZT, I have scanned it twice and used the one-click fixit button and had no problems, after this I scanned it again, then closed PC Matic, manually installed driver for my GeForce 9800GTX, and let my OneCare defragment my hard drive for a half hour. Now when I go back to scan NZXT with PC Matic, I get all the way to the last part, user data entry, and the it goes like it's retrieving my analysis. That's where it stays. It isn't that is 'not responding' or anything but I have let it go for 40 minutes and it doesn't get to the dashboard screen. If I uninstall it and reinstall it on this machine will it count towards my 5 installs? We are working with your ticket in the help desk to resolve the issue. Thank you for the logfile. Reinstalling on the same hardware with the same operating system and computer name does not use an installation.